Matured in Sherry and Port Casks. 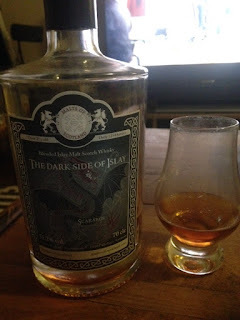 Tastes like Bowmore to me, though it's said to be a blend of three different Islay distilleries. Not that it matters, since regardless of its origins, it's fantastic. Normally, I don't care for wine/port casks, as they overpower the spirit and get sticky-sweet, but damned if this one isn't a knockout. It smells a lot like those brilliant 2004/2005 Signatory Ledaig sherry cask bottles that have come out recently: fresh asphalt, new car leather, and strawberries. The smoke is heavy, like cigar-stained clothes. And it tastes like the Ledaig bottles too: it's not too sweet at all with a 50/50 balance of peat and fruit. The finish keeps going and going, the balance is superb. I mean, maybe it's a touch sugary? But I'm looking for flaws here. 91 pts/A-. Wow. Why didn't I buy more of these? This was a steal at $150. I know, I know, "He's such a snob, he thinks $150 for a bottle is cheap?" Yeah, I do, because I'm high-class and don't have any perspective on poverty. Deal with it.